When an employee leaves a company, it is a difficult loss on many levels. For-profit companies can normally turn around and have someone else in the position without too much fanfare. For a nonprofit organization however, that employee departure can have a different impact. With the costs associated with searching for, hiring and training new employees, the loss of a talented employee can have quite the impact on a non-profit organization. Turnover rates, on average, have been increasing year over year in the nonprofit sector, and nonprofit employers can help combat these increases by being proactive in trying to reduce turnover within their own organizations. On average, only 29% of nonprofit leadership candidates are hired from internal candidates. Employees that are committed to the cause do want to stay, but many feel that they are stuck in the position they were hired into, leading them to look elsewhere for better opportunities that may allow them to grow. Research tells us that employee output begins to decline drastically after reaching a 50 hour workweek, and is reduced to its lowest after 55 hours. Many nonprofits don’t have enough core employees to handle the workload that is thrust upon them, and some workers may be putting in more hours than they should reasonably be expected to put in. “The work must be its own reward” is something heard in many circles, and often is applied to the nonprofit sector. Low pay, long hours and little to no recognition of the individual workers for their hard, sometimes life-changing work is a hard pill to swallow for many. 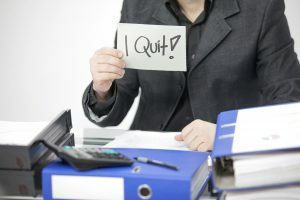 How Can Nonprofit Employers Reduce Their Employee Turnover? 1. Communicate in a healthy way with your employees. Create an environment where your employees can voice their concerns when necessary. Offer feedback on the work they do, advising them on how they can improve while remaining appreciative of their hard work. When there are opportunities for growth, allow all employees to have a chance to work towards them. 2. Set realistic expectations that are clear and accessible to your whole organization. Nonprofit employees should know what the organization’s purpose is and should feel like they have a part in it. Much of the work done by nonprofits is emotional and incredibly difficult, and when the job expectations are ambiguous as well, employees can burn out rather quickly. 3. Recognize that your team is your most valuable asset. Happy employees do great work, and the happier the employees are, the more valuable your nonprofit is to the community. The pay, development potential and sustainability of a nonprofit’s staff should be a top priority to ensure that the organization is successful and effective in its mission. Considering the impact that employee turnover can have on a nonprofit, it can be much more cost-effective for an organization to offer their employees a few extra benefits rather than to continuously deal with replacing them.